We are a passionate volunteer-based organization on a mission to create and maintain the vibrant arts community in our beautiful hometown of Okotoks, Alberta. In 1979 the Town of Okotoks purchased the CPR train station for $1.00 with the goal of creating an arts and culture centre for the community. The 11-member volunteer council, was officially registered as a not-for-profit Alberta Society on February 6, 1981. Since then, we have geared our time, energy and fundraising efforts to preserving some of the town’s historical buildings to make art and culture available to the community. We will be the central hub for Arts and Culture in the Foothills area by developing relationships with and between the art, social, business community as well as Okotoks Town Council and Administration. We will nurture positive, inclusive and engaging creativity atmosphere to inspire passion, thoughtfulness and awareness in and of art to the public. We will lead in Art educational awareness in every initiative we undertake and aim to create an educational space that will include mentorship, workshops, lectures and studio space for all forms of art. We're always looking for members for our council. Send us a note or download the OAC membership form. One of our long-term goals is developing a regional Cultural Centre. In order to achieve this goal, the OAC is working toward demonstrating the economic impact on the community of cultural, recreational and tourism activities. 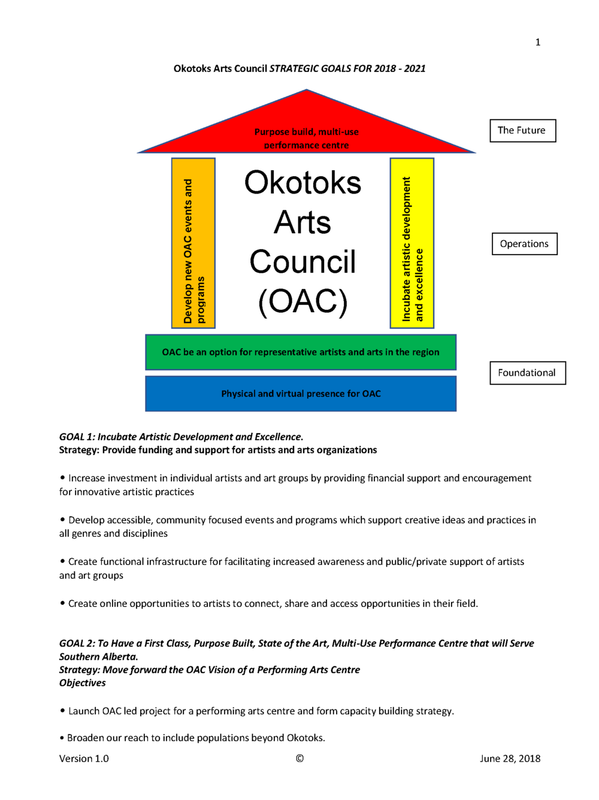 The OAC would like to showcase Okotoks as both an amazing place to live and a unique cultural destination. Our goals can only be achieved with the involvement of all sectors of the community. To help us realize our vision for the community, we welcome new members from a diversity of backgrounds.